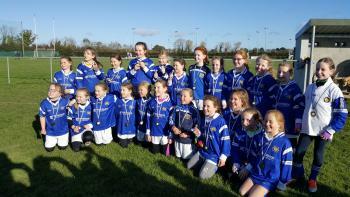 The Girls U10 Football and Camogie Team have a total of 34 Members in their squad ranging in age from 8 to 10 due to an amalgamation of two age categories in September 2017. They had a great year in the 2017 Go Games playing across two leagues in both one and two team games showing great promise and determination as well as super skills in both Camogie and Football. These girls are the ones to watch as we head enthusiastically into the 2018 season.